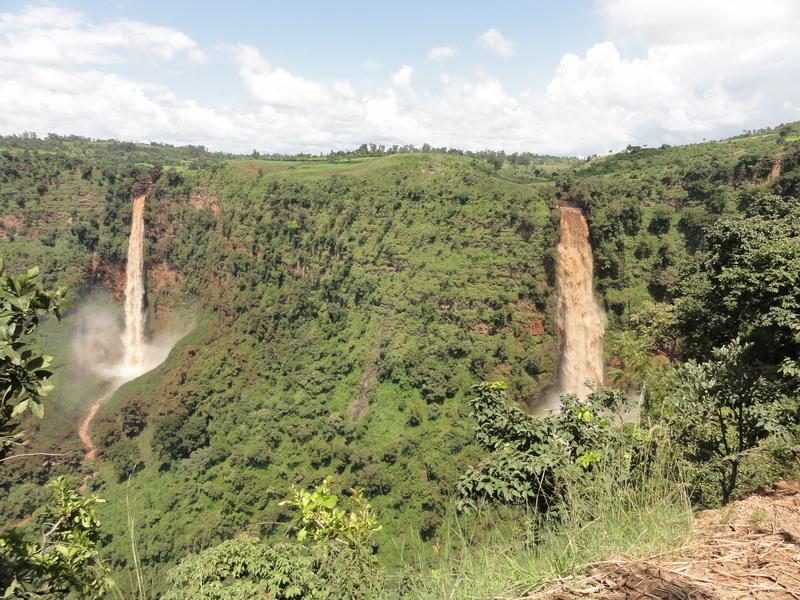 Ajora falls are twin waterfalls that are not too far from where I live. The hospital was quiet and a group of people were headed to see them, so I figured I would go and see a different kind of twins. 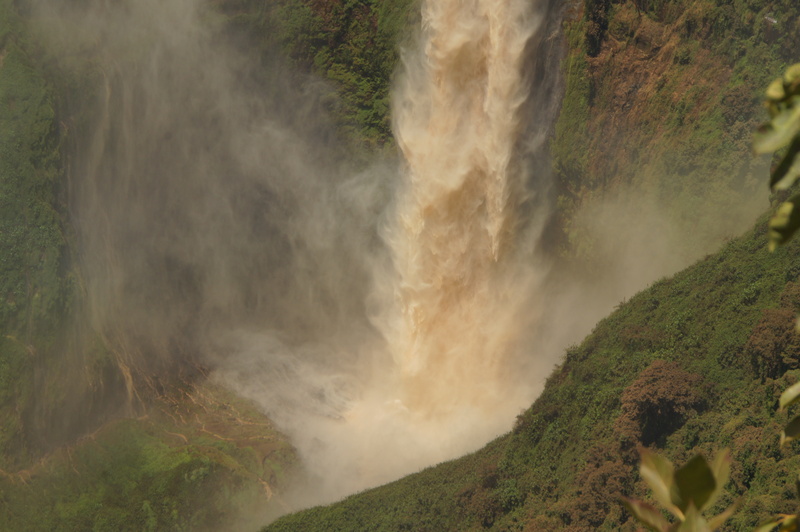 The falls form the beginning of the Omo River. If you read much about Ethiopian tribes, the famous tribes are all south in the Omo River Valley. pole for the center of a home. 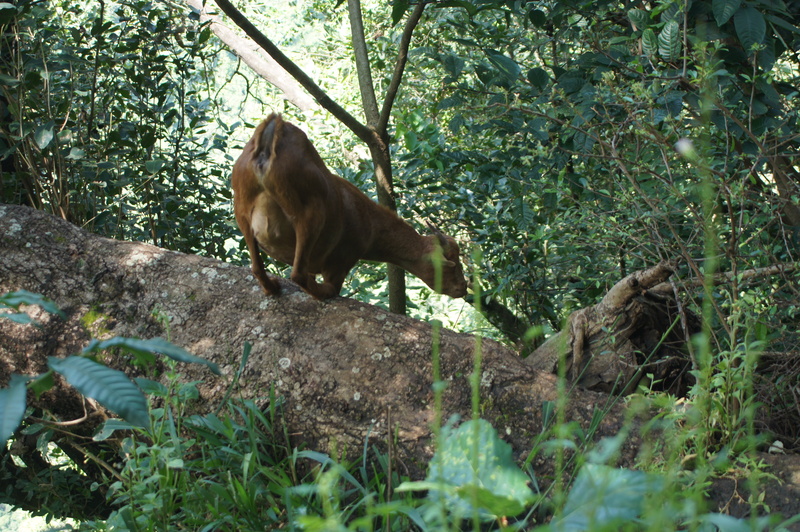 Near the springs we came across some goats that were munching on the leaves of trees. We had to stop because these were not just any normal trees. The jutted straight out and below them was the gorge, but these goats acted like they were in a pasture. They were just munching away. I was entranced by how graceful they are. 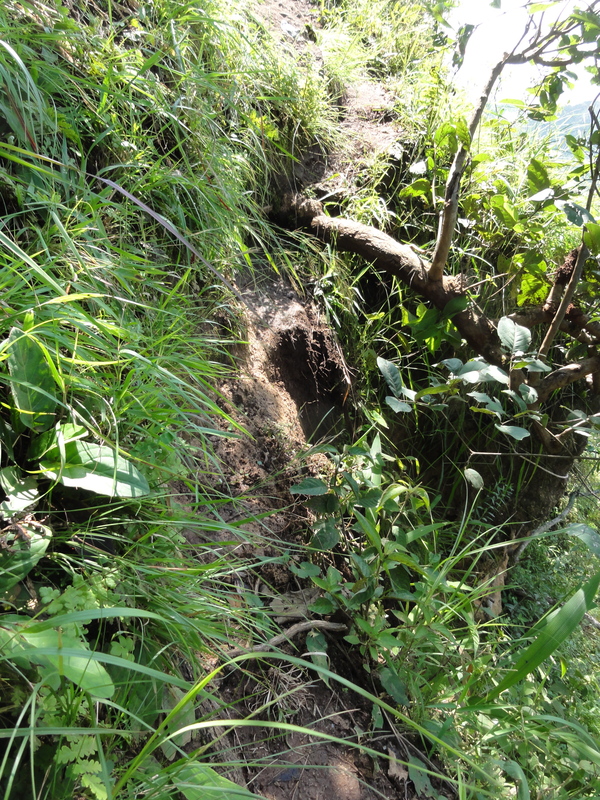 Here is where the trail used to be. The area by the root that is missing is where I stepped. one point the trail was absent. As we were going along, I stepped on an area of the trail that was just as wide as my foot. As I stepped into it, the trail disappeared beneath me. I fell about seven feet down and landed on my head and shoulder. As I was tumbling down the mountain side, I only had a few thoughts. First, I thought, “Really!?! This is how I am going to die? Who would have ever thought?” I think I even smiled. I was simultaneously trying to grab anything and everything around me. The grass and shrubs were just slipping out of my hands or breaking. I kept waiting for the free fall. Then, I wondered if I would be able to enjoy the free fall, like I was flying. I didn’t make a peep while I was falling and I felt completely a peace. For those of you that know me you don’t find me silent very often! My life did not flash before my eyes. I never felt anything, like an angel or hand, stop me. I finally, was able to grasp something. I held on to it as I tumbled over it, I fully expected it to be the ledge and wondered how long whatever I was holding would be able to support me. Then, I felt the ground under my feet and I had stopped. I yelled up, “I am fine” and just stayed there until some people got down to me. I had stopped just above a bunch of rocks and maybe 5 feet from another trail. Beyond the trail was the cliff. 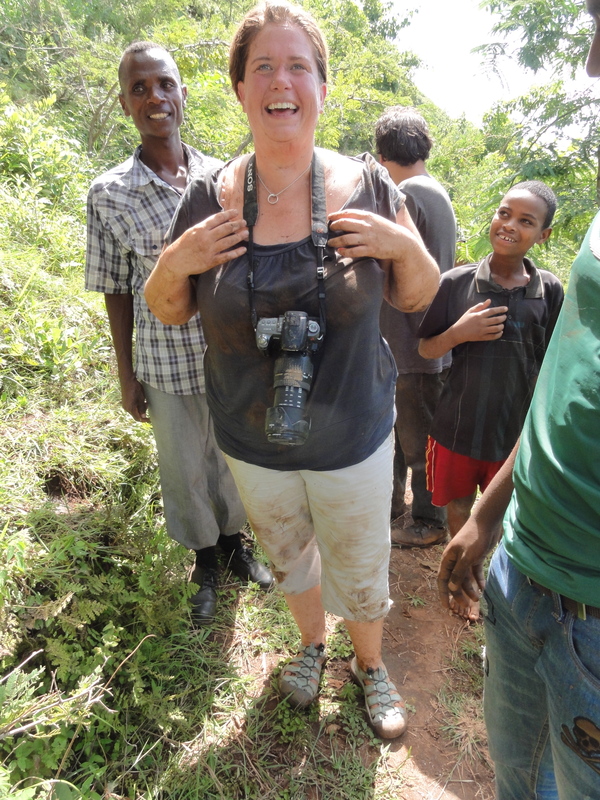 Next stop, at least 400 meters to the Omo River. found a safer way down to me. They were both to me in no time at all. Neil said when he arrived I was holding a clump of grass and my knuckles were white. We did a quick inventory and everything on me worked. I had some scratches on my hips, stomach, back and right arm. Nothing else. Funniest comment on the way to the car: “Not to be selfish, but I am so glad nothing major happened because I am not sure I could handle that kind of trauma in my life right now.” I was exhausted by the time we got back. It is amazing how tired you can become after a big adrenaline rush. After processing this for ONE ENTIRE day, I don’t have anything really profound to say. Last month I was told I was as charming as a turtle. I have now confirmed that I am NOT as graceful as a goat. I have thought about what I would want my last words to be if I had fallen off the cliff. I would have had 11-12 seconds to say what I want. The more I think about it, the more I think I would say “Woo-Hoo!” and give one of my laughs. This is a laugh that all the ladies in my family share… aunts, cousins, sister, grandmothers… You can hear us laugh from miles away. I think this would say more than any words I could spit out. I am glad that I was at peace with dying. I have questioned if the lack of fear was arrogance or faith. I wish I could easily state it was faith, but it may be a combination of the two. I am not deserving of God’s love and grace, but He has chosen to give it. I am so grateful to serve such a loving God. I can hear your beautiful laugh in my head right now and, even in my head, it’s contagious. Love and miss you, dear friend! Looking forward to our girl’s weekend in Mexico when you return. I also can hear you laughing. did you break the camera? The camera is super dirty, but works. Glad to hear you are okay! I loved to read of your hospitality to the kids in your neighborhood in your last post too! Glad to hear you are okay. You could have been hurt so badly. You’re so beautiful, and SO fun. We’re SO glad you’re okay. But, have they checked your head? … Really??!! Lol! I haven’t had my head officially checked, but it seems to be working ok, so no major damage. I have what I had before in my noggin… I am really hoping to see you all in January for Jen and Kelvin’s big day. I will be keeping Ben and your family in my prayers. HUGS to you! How scary! I’m so glad that you are okay. I can totally hear your laugh. Stephanie – I am on call and sitting her getting caught up on your blog. I am so inspired by the work you are doing. Did you ever play that game – trust fall? Well Jesus just played it with you. Continue to trust in him…you are in his hands and doing his work! God Bless you Stephanie. I had a Mom look up to me and ask – Doctor will you help me? I got to thinking…is she asking me or asking God? God has given me the heart to know him , the hands to do surgery, a medical education to help his people who are ill…but still at times I fail and do not win. Did I fail God? Did I fail that baby, or that mom? I can’t help but think so. So in my darkest hours now…all I think to myself is – WHere does my help come from? …My help comes from the Lord. The maker of Heaven of Earth. I will continue to take the blessing he gave me and continue to serve him through doing the best I can! Stephanie – Thank you for doing the best you can to serve at Soddo. I will say a special prayer for you tonight to praise God for catching you on your fall! I LOVE your heart! Thank you for your encouraging words. And work here or there is never easy when dealing with death and all of the sad situations we find some of our patients in. It is hard no matter what. This morning we lost a baby to a shoulder dystocia. I was called in at least 10-15 minutes after the fact. Nothing could be done. A beautiful little girl is in our makers arms. I classmate of mine sent me your blog last week. I’m taking Step 2 on Friday so I’ve been reading during my procrastination time. I’m only at your April posts, but I’ll catch up soon! I’m also pursuing ob/gyn and I’m a global health junkie. If all goes as planed I’ll be heading to Honduras next spring! I’ve never gotten the chance to talk to a mission ob/gyn before. Do you have an email I can reach you at so I can pick your brain? My email is hailstephanie@hotmail.com. Feel free to contact me with any questions. I got a lovely note from Ethiopia and couldn’t figure out who I knew there. Then I remembered the tiny donation I sent and I figured it out. Thanks for the note; it was unnecessary. 🙂 Thank you! Even thought we have never met, I feel so blessed when I read your blog. I smile, laugh, and cry as I see God working through you. My heart goes out to your ministry and the street boys. I can’t imagine seeing children without a family and sleeping on the streets. I want to gather them all up and give them a home. Years ago, my husband gave me a couple saying that I would like to share with you. 2. Happy moments praise God, Difficult moments seek God, Quiet moments worship God, Painful moments trust God, Every moment Thank God. The women in my family also have a very distinctive laugh that our husbands, uncles, and fathers call “The Cavanaugh Cackle”. Keep spreading Gods love and remember to laugh every day.